North Shore direct beachfront residence. Classic Hawaii architectural design opening to stunning white sand beach, sparkling waters, everlasting sunsets, & the waves washing up on the Point. Prime location off of the main road with gated entry. Three bedroom main house w/large loft perfect for your office, family/media room or overflow guests, plus separate studio cottage & two car garage. New extensively remodeled studio cottage- huge value. 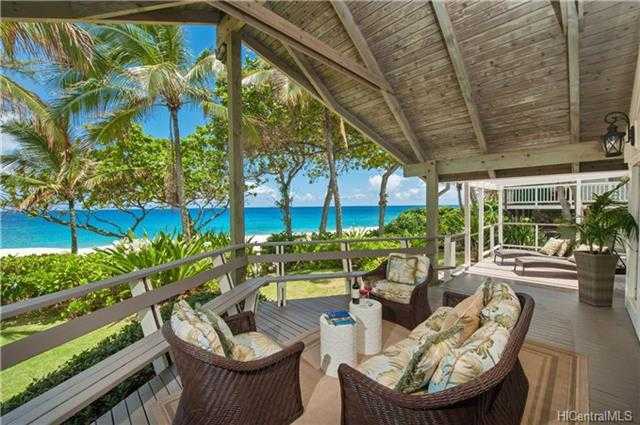 Watch the world go by from the privacy of your large covered lanai enticing you to jump in the ocean or walk the beach. Some of the North Shores’ finest surfing nearby & snorkeling right off your property. Please, send me more information on this property: MLS# 201816525 – $3,750,000 – 59-571 Ke Iki Road, Haleiwa, HI 96712. I would like to schedule a showing appointment for this property: MLS# 201816525 – $3,750,000 – 59-571 Ke Iki Road, Haleiwa, HI 96712.